Next Spring will bring some grand openings in the Riviera Nayarit: Grupo Vidanta will inaugurate its convention center in March 2017 and Bel Air Unique will open theirs in June 2017. 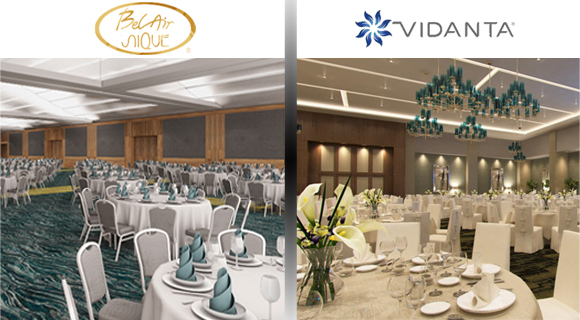 The Riviera Nayarit is a constantly evolving destination and, in order to fulfill the increasing demands of the meetings industry, Nuevo Vallarta’s Grupo Vidanta and Hotel Bel Air Unique Resort & Convention Center Vallarta in Flamingos are both building enormous new convention centers. The first to open will be the Vidanta Nuevo Vallarta Convention Center, scheduled for inauguration in March 2017. It will have four main ballrooms with over 32,290 sq. ft. of space, making it the largest in the destination with a capacity for up to 2,400 people. On each side it will have foyer areas with 14,316 sq. ft. of space and four small rooms. The huge complex will also offer several other rooms, meeting spaces, beach areas, terraces and the famous Santuario with 75,347 sq. ft. The Grand Mayan Playa boasts the largest space in this development with capacity for up to 3,000 attendees in a cocktail setting. The Bel Air Unique, located in the Flamingos area, has begun a top-to-bottom remodel where it will increase their number of rooms from 215 to 480, add another five pools to the current one, and increase their restaurants from two to six, not to mention many other new amenities for their guests, among them, the Bel Air Convention Center, projected to open in June 2017. The interior and outdoor convention areas for this hotel will be able to host up to 3,600 people simultaneously in the 33,906 sq. ft. of available area. The Gran Salón Bucerías will the largest ballroom with an area of over 15,000 sq. ft. and room for up to 1,600 people; it can also be divided into six smaller rooms. In addition, the center will have a foyer with over 8,000 sq. ft. of space and room for up to 860 people. The two outdoor spaces are the Las Tortugas Garden with over 8,000 sq. ft. of space for up to 860 people and the Playa de Chacala Area with 2,690 sq. ft. and capacity for up to 280 attendees. All the spaces can be set up in the auditorium, classroom, banquet and cocktail styles, among others.